Let your skin radiate a healthy glow en route to motherhood and after, with this all natural and ayurvedic oil from an ancient recipe. During pregnancy, it is normal for your progesterone and oestrogen levels to be raised. This leads to the formation of excessive melanin by melanocytes, which in turn causes black spots and other hyperpigmentation on your skin. The status of the skin persists during the post-partum period. As cosmetic treatments are not advised during pregnancy, it would be appropriate to bring back the radiance and glow of your natural skin by natural means. 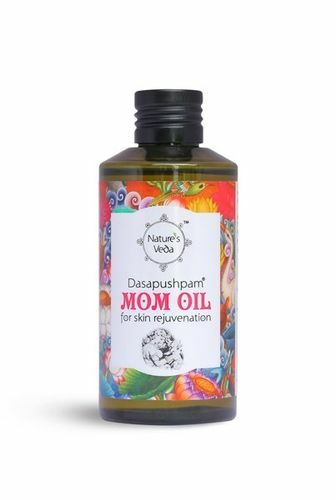 Nature Veda's dasapushpam mom oil will optimize the secretion of the natural oils of the skin, keep the pores open, and remove the slough of dead cells on the surface efficiently during pregnancy. Studies have proven that early skin to skin contact between infants and their mothers contribute a lot to the development of physiological and psychological behavior of the child. During this time, it is very important for the lactating mother to have the most secure, healthy and sterile skin. The herbal ingredients of this mom oil will provide enough anti-bacterial and anti-inflammatory properties to your skin so that your baby is most secure while being proximal to you. The therapeutic properties inherent in the recipe of nature's veda mom oil also helps provide the necessary buffing and polishing naturally to remove stretch marks gradually. Nature's veda dasapushpam mom oil can be applied on your body, face and hair. The oil is thin in consistency so that it is easy to wash off and has better skin absorption. Nature's veda dasapushpam mom oil will help prevent pregnancy related skin issues like rashes, stretch marks and pigmentation. Simply put mom oil helps bring back the radiance and glow of your natural skin by natural means. Nature's veda mom oil will also help optimize the secretion of the natural oils of the skin, keeps the pores open, and remove dead cells on the surface efficiently during pregnancy and after. Explore the entire range of Massage Oil available on Nykaa. Shop more Nature's Veda products here.You can browse through the complete world of Nature's Veda Massage Oil .